Thank you to everyone who has written to me about the Prime Minister’s proposed Withdrawal Agreement and Political Declaration on the future relationship of the UK with the EU. I have received a wide range of correspondence, covering the full spectrum of opinion from remaining in the EU after all, whether with or without a further referendum, through accepting the Prime Minister’s deal to leaving without a Withdrawal Agreement and trading on WTO terms. I remain convinced that only two kinds of exit would be consistent with the vote to leave the EU. Either we should leave with a deal of the kind the EU offered us in March, or we should leave and trade on WTO terms. Other suggestions such as remaining in the EU, the EU’s Customs Union or the European Economic Area would not be consistent with leaving and taking the power to make legislation back to our Parliament. It is true that I have reservations about the Prime Minister’s deal but these are not small matters to be brushed lightly away. If the deal did unequivocally restore sovereignty to Parliament, liberate our fishermen and farmers and take control of UK migration, then I should be able to support it. Unfortunately, the deal has profound shortcomings. As a minister for exiting the EU, I was willing to make compromises which I would still support. These include the creation of a superclass of EU citizens with 8 years’ voluntary reference to the CJEU on questions of interpretation of EU law. In exchange for a sensible future relationship, I remain willing to support paying the financial settlement, notwithstanding the House of Lords demonstrating that legally we owe nothing. I would also support the “Implementation Period”, despite its dreadful construction, if it led to independence after a short, limited period. However, this Withdrawal Agreement would leave us trapped indefinitely as a satellite of the EU, obeying its laws without a say, unless the EU and its members gave permission for us to leave. Democratically, we would be in a worse position than EU members, potentially forever, with no lawful means of escape. Second, the Political Declaration is so weak and ambiguous as to leave us paying £39bn – that is, £1,400 per UK family, or £60m per constituency – and getting nothing in return. This is despite the EU’s lead negotiator, Michel Barnier telling Parliament he was willing to link payment with progress towards a free trade agreement. Third, on the interpretation of the Political Declaration made by the Prime Minister, we would be heading into a trading arrangement based on a “single customs territory” and a high degree of mandatory alignment to EU rules. A single customs territory is the product of a customs union, which would eliminate our capacity to conduct an independent trade policy. Entering one would be a direct breach of our recent manifesto pledge to leave the EU Customs Union. A high degree of mandatory alignment to EU rules would not only leave us vulnerable as rule-takers, but it too would eliminate our capacity for an independent trade and regulatory policy. Fourth, the Union of the UK would be damaged by differential treatment for Northern Ireland. Since the DUP are simply unable to tolerate threats to the Union, the confidence and supply arrangement would end if the deal were passed, leading to a general election. In other words, we are being asked to collapse the government in order to take the risk that the EU would release us from a position of abject subjugation – whether in an extended Implementation Period or the backstop – into a relationship of damage limitation as a regulatory satellite of a bureaucracy which would be substantially more bureaucratic for our departure. This I will not support. What would alienate vast swathes of the country would be to fail to honour the referendum result, either by accepting this hopeless deal or by returning to the country for a further referendum. I will support neither. The offer included security co-operation, participation in various programmes and institutions, dealing with absurdities like any threat to flights, and a comprehensive advanced free trade agreement covering all sectors with no tariffs, no quantitative restrictions and including services. It is not yet clear why the Prime Minister – working against the collective decision of DExEU ministers to which I was a party – chose instead to seek a form of Brexit somewhat like the Customs Union plus somewhat like the EEA. That would be a novel legal form, likely to collapse into the actual Customs Union plus a copy of the EEA in the course of negotiations. It would be untenable in the long term for an independent democracy to be so constrained as a rule-taker. Yet this appears to be the chosen destination. 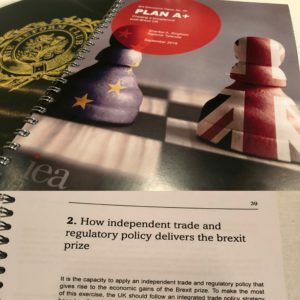 I thoroughly recommend Plan A+ for an insight into how the UK could transform world trade policy for the betterment of billions of people. This is the prize which the Prime Minister’s deal takes off the table. People are of course tired of bickering over Brexit. Unfortunately, the arguments are over matters of the first importance, often poorly understood by people of good faith and misrepresented by those with political agendas who do not accept the referendum result. Most of us just want to agree a deal and move on. Regrettably, the Prime Minister’s deal is intolerable for the reasons I have given. I hope this reply is helpful in understanding why I will be opposing the Prime Minister’s deal and asking for an exit of the kind the EU offered, based on an advanced free trade agreement, leaving us as a normal independent country, not a satellite of the EU.